A little less than a year ago, left back was Palestine’s greatest area of weakness. With Poland based Alexis Norambuena withheld from participating from the lion’s share of national team games, former national team manager Jamal Mahmoud auditioned a host of deputies to little success. The problem was so glaring that opponents went looking to exploit that area of the field knowing it was only a matter of time before a mistake could gift them a goal. Seemingly out of nowhere, up stepped Abdallah Jaber a 21 year-old who had only just joined Hilal Al-Quds months earlier for the 2013/14 campaign after struggling to find playing time with Ironi Ramat Hasharon of Ligat Ha’al on the other side of the Green Line. Many WBPL (West Bank Premier League) products have been given a chance to prove their worth with the national team but few have succeeded like Abdallah Jaber has. Earning his first cap against Kyrgyzstan at the 2014 Challenge Cup, Jaber’s positioning was excellent and he showed a knack for going forward as well. In his second cap, he was involved in the buildup of Ashraf Nu’man’s first goal of the tournament against Myanmar. When all was said and done, the youngster had logged 360 minutes of play and helped Palestine win the Challenge Cup without conceding a single goal. 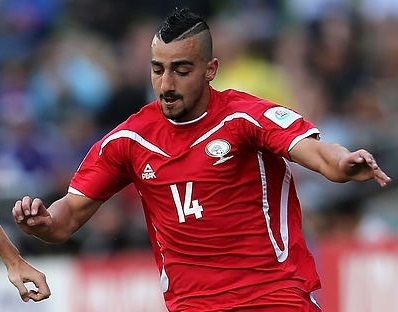 The Tayibeh native continued his scintillating form with the Olympic team in the fall, playing every single minute of Palestine’s four games- helping them score and win for the first time ever at an Asian Games. Palestine would go on to win their group, topping the likes of Oman, Tajikistan, and Singapore with a six point haul. One month later, Abdallah Jaber scored the clinching goal in a 2-0 win against Pakistan to open up his goal scoring account on the eve of his eighth cap. With every step up in quality, Jaber has risen to the task and that was also the case in Palestine’s debut against Japan. Having scouted Palestine beforehand, the Samurai Blue dispatched Keiskue Honda to exploit Palestine’s perceived weakness. True to form, Jaber was fearless in dealing with threat from the AC Milan superstar- he stood his ground, picked his spots and even managed a bombing run up the flank within the first five minutes of the game. Perhaps unsurprisingly, the Hilal Al-Quds left back once again went the distance playing all 360 minutes of Palestine’s maiden Asian Cup campaign. A feat only matched by Palestine’s vice captain- Abdelatif Bahdari. Arguably Palestine’s best player over the past six months, do not be surprised to see Jaber make the move to a bigger league in the near future.